One of the main points of purchasing a minivan is the ability to move passengers and cargo in a comfortable manner. When dealing with a family, that means being equipped with features that everyone can enjoy. 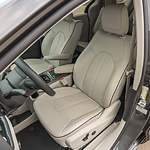 The 2018 Chrysler Pacifica seeks to stake its claim among the best minivans by offering diverse interior features. When you make the trip to Lithia Chrysler Jeep Dodge of Billings to examine the 2018 Pacifica, you will discover a great many things. The Chrysler Pacifica was made to get you and your family around and it is capable of seating 8. This includes heated and ventilated front seats and power folding seats in the third row. The Chrysler Pacifica also has you covered if you ever need to move maximum cargo. The Stow 'n Go Storage and Seating system allows you to fold both the second and third-row seats into the floor providing ample space to move the things you need to.